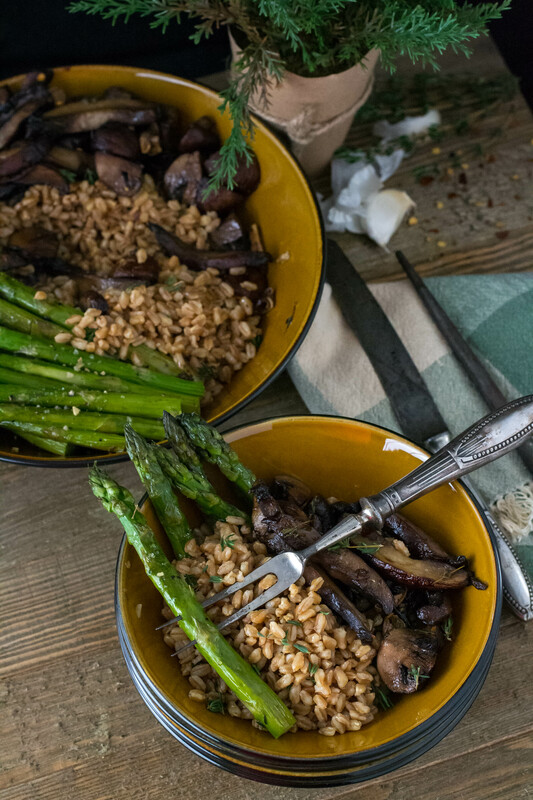 Roasted Mushroom Asparagus Farro - What the Forks for Dinner? 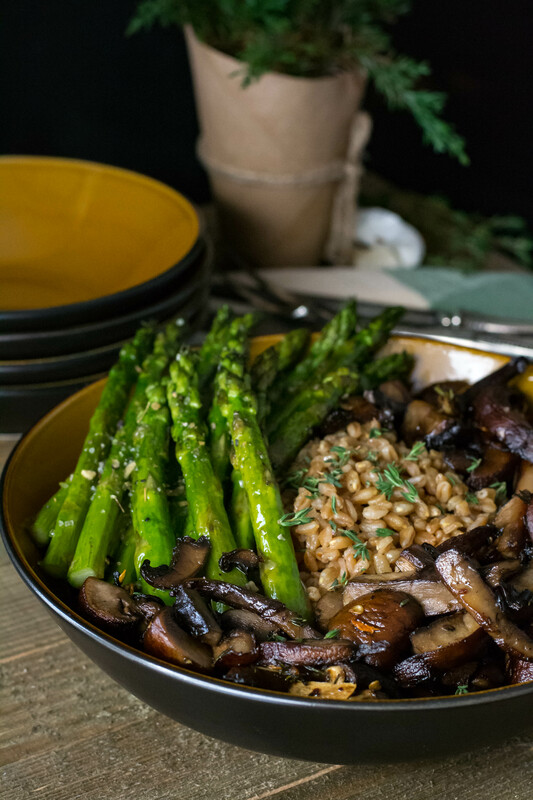 My first recipe using farro was back in 2015. Salmon Farro Salad was really delicious and healthy. Whole grain was just coming into the spotlight, and I made several recipes using farro (I will link more at the end of the post). As I mentioned in my last post keeping on point with trends is a huge part of food blogging. Mushrooms are popping up all over….literally. 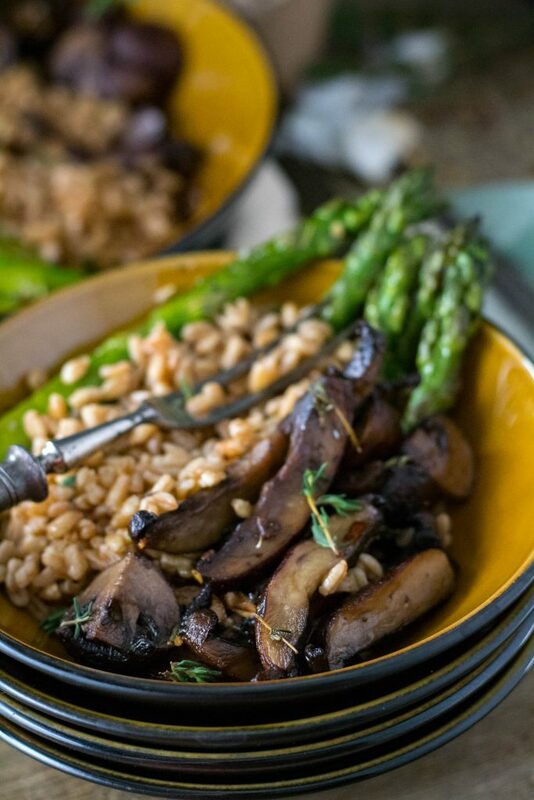 Mushrooms can be a substitute for meat, and portobello mushrooms are one of my favorites. For this recipe, I used two varieties. Small baby Bellas and the large caps. Living in a smaller community does have its downfalls in the culinary world. I wanted to use a mix of wild mushrooms, but alas no stores in the area carried them. If you have the availability, I would highly recommend trying them. Roasting mushrooms or any veggie for that matter, yes the asparagus too, gives them a depth of flavor without a lot of extra ingredients. Just a few herbs and garlic. Drizzle with avocado oil or the oil of your choice, and you have a fantastic veggie. 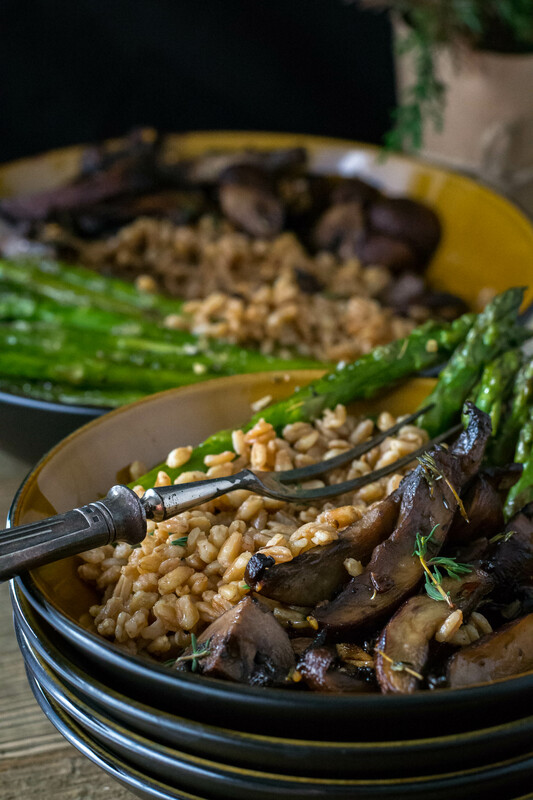 Roasted veggies can top pasta rice or any grain, and they are always the right choice next to meat, chicken or fish. Recipes are sometimes a challenge for us as we sometimes make several recipes in one day and more over a weekend. We still both have to work regular jobs….at least for a few more years. Having extra food is the norm at our house. Roasted Mushroom Asparagus Farro held very well. It was tasty even cool, although I do prefer it warm. I divided it into to-go containers….lunch for the week. 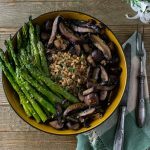 Healthy and tasty add Roasted Mushroom Asparagus Farro to your short list of recipes make ahead lunches or dinners! Add 2 cups of water/stock, rinsed farro, and seasonings. When done cooking, natural pressure release for 5 minutes, then quick release. Place racks in bottom third and middle of oven; preheat to 350°F. Toss mushrooms, garlic, thyme, red pepper flakes, avocado oil, 1/2 teaspoon garlic pepper and 1/2 teaspoon salt on a rimmed baking sheet. Roast on the bottom rack, tossing halfway through, until deeply golden brown and caramelized, 25–30 minutes. 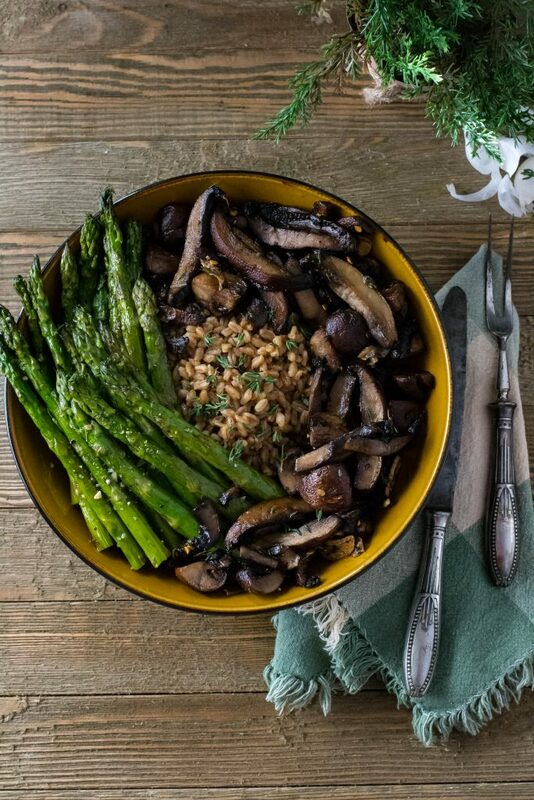 Arrange mushrooms and asparagus around cooked farro in a serving bowl. Garnish with extra thyme if desired.